Granite Transformations franchise owners Bret and Kathy Foster admit it. Their company name may confuse some Nashville residents who think they’re “just another countertop company.” In truth, they’re so much more. They specialize in reducing the pain of kitchen and bath remodeling projects. They transform kitchens countertops and backsplash in as little as one day and do complete bathroom makeovers in a week. Granite Transformations is the answer for homeowners who want their lives returning to normal as quickly as possible. Rather than living months on end dining out with their kitchen torn apart, or having the entire family sharing the master bathroom while the kids’ bathroom is remodeled, Granite Transformations is the quick-change artist. A: What is the incentive for homeowners to remodel their kitchen or bathroom? Bret: Depending on where you are, you’re looking at an 80% to 110% return on your investment. That’s why most of those remodeling shows on HGTV focus on the kitchens and bathrooms first. A: What are the hottest trends in kitchen designs today? Bret: Shaker-style cabinets done in lighter colors—mostly greys and whites. Homeowners are moving away from beiges and browns in cabinets and countertops. In terms of countertops, quartz has overtaken granite. Again, lighter color is in. Kathy: I agree. It’s because quartz is easier material to maintain. It’s not porous, you don’t have to seal quartz like you do granite, and you needn’t worry about what you’re cleaning it with. It’s also a more uniform look. People like a more consistent, clean look. There’s no pitting to the surface of quartz like you see with granite. Bret: We’re not seeing as many farm sink installations in updating kitchens as you might assume from all of the Houzz.com and Pinterest pages people are saving out there. Farm sinks are hard to install if you’re not doing huge re-modification work to your cabinets to support the weight and size of them. The homeowners who are requesting them seem to request mostly white ceramic farm sinks. Kathy: Homeowners love converting their bottom kitchen and bath cabinets into drawers. It’s been in the European market forever, and we’re glad it’s growing here. For us, it’s just a slight modification, but it makes the homeowner so much happier because their kitchen is now functional for the first time. They are gaining so much more useful space for storage. It’s a smart, easy design alteration. A: How are you able to complete a major kitchen or bath remodel in five or six workdays? Bret: We are organized and efficient using our own labor or subs who work with us every day. 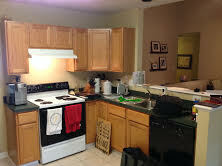 We do cabinet refacing and countertop resurfacing only. We can add and raise cabinets, make all of the modifications, and then reface everything to look the same. Once you start tearing out cabinets, you’re dealing with plumbing, flooring and electrical modifications. We avoid that. We get in and get out. Even our bathroom remodels takes a week or less. A: What’s the most unique design request you’ve had? Bret: We had a Jamaican woman who insisted upon bright red countertops with sparkling mirror chips embedded in the countertops. I didn’t dare show that to my mom or she would have wanted it, too! We embedded the mascot for a local high school into the countertop of their concession stand, but probably the most intricate piece lately was the mosaic profile we did of Johnny Cash, all hand-cut glass for a beautiful wall accent based on one of his photographs. Our team can create any customized design you request. This is a great asset for interior designers, artists, and creatives out there who want to see their unique art, logo, or image design interpreted in a wall accent, shower, backsplash or even the bottom of a swimming pool. A: How do you transform countertops? What is your approach? Bret: We’re a very unique product – there’s no one who does what we do the way we do it. Our material is a thin product that we fabricate to overlay existing surfaces, so it’s a unique technology. No one else has taken the time and money to develop the same technology and equipment. People have tried, dabbled and gotten back out of it. Our signature quartz characteristic product has been around for 40 years and we have covered countertops for 20. Granite Transformations has continued to improve the technology, and no one else has gone to the time and expense to fabricate it. Our countertop material is 1/4″ thick. We’re not tearing out old countertops. We’re recovering existing countertops. We’re putting a lighter-weight, more durable material on top of their existing countertop. From a sustainability standpoint, we feel good about the fact that we’re not filling a landfill with our customers’ old countertops. Our proprietary material is thin and easier to work with. We can even use this material to place in a shower and slope it downward so it will drain. A: Which areas do you service? Kathy: We cover a 1.5-hour radius from Nashville, butting up to our colleague’s Knoxville location. We chose to base our operations here because we wanted to live in Nashville. There’s so much opportunity here that we have no plans to expand beyond Nashville. A: Are there any projects you won’t take on? Too large or too small? Bret: We do a lot of unique work, but we keep our scope very tight. We don’t do jobs that require painting. We’ll do our portion of a remodel and then let the homeowners hire their own painter. We don’t do much drywall work. We’ll move a wall if we’re making a tub smaller or a shower bigger, but we won’t do full-blown remodeling projects. There’s no project too small for us. We’ll take on the small projects that many will turn down. A: Tell us about your team in Nashville. How many employees do you have? Kathy: There are 13 of us, including Bret and me. We’re small enough to be hands-on, and big enough to not be a one-man band. We are always aware of where everyone is and what they’re working on. We run a tight operation. A: What were your backgrounds? How did you get into this business? Kathy: We both hail from the building materials industry. I met Bret during my first job out of college, working with a sales rep in a Pella Windows showroom in Wilmington, North Carolina. Bret: My mom owned a residential contracting business in South Carolina, so I guess you could say I grew up in the business. After college I worked at Pella Windows in Greensboro, installing their CAD system, doing their technical drawings on the commercial side of the business, and I eventually worked my way up into sales, operations and marketing. A: Do you have any final advice for a homeowner considering a remodeling project? Bret: Be open to the suggestions your contractor makes, but get more than one opinion. And, of course, call us for sound advice and an economic solution! A: How can our readers find you? Kathy: Our website is http://www.granitetransformations.com/nashville/ and we welcome you to call us at (615) 332-8434. Our store is located at 5215 Linbar Drive Suite 207, Nashville, TN 37211.